Be the first to share your favorite memory, photo or story of Dr. Richard . This memorial page is dedicated for family, friends and future generations to celebrate the life of their loved one. 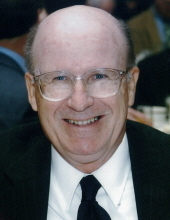 Dr. Richard A. Stevenson, 80, of Iowa City, died Friday, November 16, at Oaknoll Health Center surrounded by his family. Mass of Christian Burial will be Tuesday, November 27, 10:30am, at St. Thomas More Catholic Church, Coralville. Burial will be at St. Joseph Cemetery. Visitation will be Monday, November 26 from 4:00 to 7:00pm. at Lensing’s Oak Hill, Coralville. Richard was born on August 5, 1938 in Utica, New York, son of Dr. Edward and Doris (Walther) Stevenson. He is a graduate of St. Bonaventure University in Olean, New York, and a recipient of a New York State Regents’ four-year scholarship. He received his MBA in finance from Syracuse University and his PhD from Michigan State University. While at Michigan State, he was awarded the distinguished Ford Fellowship in Business Administration. Richard was professor emeritus at the University of Iowa’s Tippie College of Business. He was a dedicated teacher and received the Collegiate Teaching Award in 1992. During his more than 30-year career at the University, Richard served in a number of leadership positions, including Director of Graduate Studies in Business, Acting Associate Dean of the Business School, Chair of the Finance Department, and Acting University Treasurer. Richard was a Chartered Financial Analyst and served as an independent financial advisor in the community for almost 40 years. Serving his financial advisory clients, especially during difficult times, was one of the things Richard enjoyed the most. He was also an avid cyclist, participating in over 20 RAGBRAI rides. He rode in rides throughout the country and in Europe; but he was most proud of his ride from Iowa City to upstate New York in l985 to celebrate his father’s 80th birthday. Richard was also active in the community, serving as the Chair of the Board of the University of Iowa Credit Union, as treasurer for Bicyclists of Iowa City, and on the Iowa Heart Association Investment Committee. Richard is survived by his wife Sheila; their children Daniel Stevenson (Teri Stevenson) of Eau Claire, WI; Maura Stevenson (Keith Klingler) of Columbus, OH, and Susan Felix (Rhett Felix) of Bloomington, IL; four grandchildren: Riley and Nolan Stevenson, Allison Klingler, and Roman Felix; sister Mary Stevenson of Fayetteville, NC, brother-in-law Fred Vaughn, and sister-in law Rita Swiderski. He was preceded in death by his parents, Dr. Edward & Doris Stevenson, brothers-in-law Patrick Vaughn and David Vaughn, and sister-in-law Rosemary Blystone. He was a loving and proud father and grandfather. The Stevenson family would like to thank the staff at Oaknoll for their amazing care and support--administrators, nurses, CNAs, dining room staff. They are also thankful for the kindness of the Hospice nurses, who helped him in his final weeks. In lieu of flowers, Richard’s family requests memorials be directed toward Iowa City Hospice or The University of Iowa Foundation. "Email Address" would like to share the life celebration of Dr. Richard A. Stevenson. Click on the "link" to go to share a favorite memory or leave a condolence message for the family.